Allergy Advice: Contains Fish (Anchovy), Soybean. Ingredients: Dried Fish (Anchovy) (45%), Soybean Oil, Fermented Black Bean (25.5%), Hot Pepper (3.1%), Sugar, Salt. 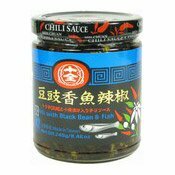 Simply enter your details below and we will send you an e-mail when “Chilli With Black Beans & Fish (十全豆豉香魚辣椒)” is back in stock!